Justifying US pullout from the Iran nuclear deal, Trump says it’s a radical regime that is the world’s leading state sponsor of terror. New Delhi: US President Donald Trump has said it is time to end the eighteen-year old war with Afghanistan even as he stressed that America is achieving progress in hammering out a peace deal with the Taliban. Trump had announced last year in December that the US will be withdrawing its troops from Syria, Iraq and Afghanistan. With Afghanistan, where the US had been fighting a war against the Taliban for the last 18 years, it has appointed a special envoy Zalmay Khalilzad, an Afghan-born former US ambassador to Kabul and Iraq. After spending a massive $900 billion in Afghanistan since 2001 and killing of 2,300 American soldiers, Trump has vowed to reduce the presence of US military troops there by half from 14,000 currently. “In Afghanistan, my administration is holding constructive talks with a number of Afghan groups, including the Taliban. As we make progress in these negotiations, we will be able to reduce our troop presence and focus on counter-terrorism,” he said. Trump also defended his administration’s decision to pull out of the Iran nuclear deal, even as he called the regime there as the leading sponsor of terror. “My administration has acted decisively to confront the world’s leading state sponsor of terror: the radical regime in Iran. To ensure this corrupt dictatorship never acquires nuclear weapons, I withdrew the United States from the disastrous Iran nuclear deal,” he said. 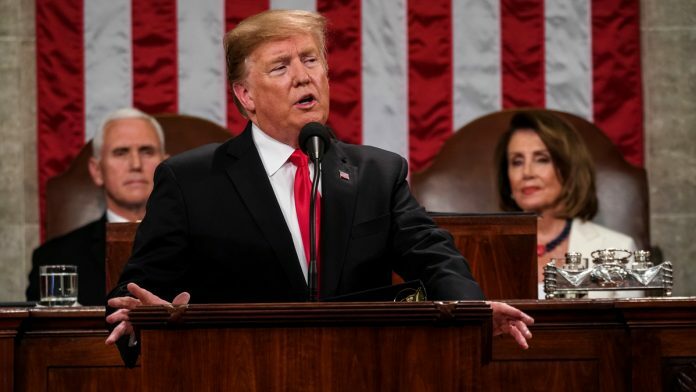 Trump delivered his speech amid raging debate between the Republicans and Democrats over whether or not US should build a $5.7-billion wall along its border with Mexico. The President delivered his second State of the Union address after it was postponed from 29 January when he unable to deliver the speech due to a 35-day federal shutdown that ended last week. But Trump has threatened that if the Congress fails to reach an agreement to fund his border wall, the government will shut down again on 15 February. He has also said earlier that if a deal is not achieved, he might declare national emergency to garner funds to build the wall, which according to him, will not be a concrete wall but a “smart, steel and see-through” wall. Previous articleGuaido vs Maduro: Where do countries stand on the Venezuela crisis?